On Wednesday, the consumer prices report was released. 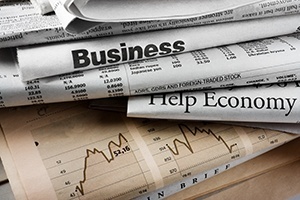 The headline index, which includes energy and food, rose by more than expected; it went from a 0.2-percent increase in February to a 0.4-percent increase for March on a rebound in energy prices. This result takes the annual rate from 1.5 percent to 1.9 percent, which is still below the Fed’s inflation target. The increase was entirely due to gasoline prices and will likely moderate as those prices stabilize. The core index, which excludes energy and food and is a better economic indicator, stayed low at 0.1 percent for both February and March. On an annual basis, it edged down from 2.1 percent to 2 percent, a 13-month low. Overall, these figures show that inflation remains under control. Also on Wednesday, we got some insight into the Fed’s decision last month to leave rates unchanged as the minutes from the Fed’s March meeting were released. Although the committee’s economic expectations remained healthy for the most part here in the U.S., increased worries about the global economy were apparent, as well as the conclusion that inflation remained under control. The notes showed that Fed members are unlikely to raise rates this year, in line with expectations, but included little color on how they plan to stop reducing the Fed balance sheet. Overall, the notes reinforced market expectations of a steady rate policy. The producer price report was released on Thursday. The headline number rose from 0.1 percent to 0.6 percent, well above expectations but again due to energy. Here, the annual rate rose from 1.9 percent to 2.2 percent. The core index, excluding food and energy, also rose by more than expected. It went from a 0.1-percent increase in February to a 0.3-percent increase in March, above expectations. But the annual rate dropped from 2.5 percent to 2.4 percent on base effects. These numbers are largely consistent with the consumer prices report and have the same meaning. Finally, the University of Michigan consumer confidence survey, released on Friday, came in below expectations. It dropped from 98.4 in March to 96.9 in April. The decline was driven by lower future expectations and occurred despite the recent rise in the stock market and rebound in job growth. Although the number remains relatively high on a historical basis, the trend appears to have shifted to negative, which is also confirmed by the recent weaker results from the Conference Board surveys. This drop could signal slower consumer spending growth going forward.